Netfirms Review 2019: Is Netfirms a Good Hosting? Netfirms provides straightforward web hosting and e-commerce hosting with popular software such as WordPress and Shopsite, all hosted in the United States. Netfirms was founded in the year 1998, which means they have a longstanding track record of providing excellent hosting solutions. Currently, they serve over 1.2 million customers from all over the world. Their offices, support teams, and Tier 1 data centers are primarily located in the United States. Note that while they do offer domain registration services, it isn’t free — you’ll have to pay up an additional fee for it. From time to time, they do have promotional coupons which entitle you to a free one-year domain registration with the purchase of an annual shared hosting or VPS plan, but the notice of these promotions are usually tucked all the way at the bottom of the website, so you’ll have to look out for them. Shopsite: E-commerce customers get to use the excellent Shopsite platform to create and manage their online store. WordPress 1-Click Install: Web hosting plans come with one-click installs of a range of software, including WordPress, Joomla, Drupal, and phpBB. Ready-to-go Websites™: This tool is provided with their web hosting plans and allows you to choose from a set of templates to use as your website if you don’t have time for another solution. It’s obvious that Netfirms tries to make their hosting products as simple and easy to use as possible by providing the necessary builder software. Shopsite, WordPress, Ready-to-go Websites™, and the rest will greatly increase the speed and convenience with which you can set up your website. The purchasing process is also very straightforward and quick. Netfirms employs clustered hosting technology to distribute resources to their customer’s solutions efficiently, which basically means that you’ll get better performance, scalability, and security with your servers. Note, however, that they don’t have an uptime guarantee. Web Hosting: All plans provide unlimited disk storage, scalable bandwidth, $100 Bing Ads, $100 Google AdWords credit, unlimited email accounts, and their Ready-to-go Websites™ tool. Advantage: five MySQL databases and 50 FTP accounts. Plus: 200 MySQL databases and 100 FTP accounts. Business: Unlimited MySQL databases and FTP accounts. E-commerce Hosting: This solution comes with Shopsite pre-installed as well as unlimited disk space, support for unlimited domains, unlimited email accounts, and scalable data transfer. While there is no trickery to their pricing and it’s cheap considering the features and resources you get, you should be aware of their fair usage policy considering bandwidth as you’ll be asked to upgrade or pay extra when you exceed a reasonable allotment. Netfirms’ 24/7 support is provided via ticket, toll-free numbers, or live chat for all their customers. On top of their free technical support, you can enlist their professional services to help with other aspects of hosting your website, such as database creation, WordPress, website creation, or website management. In my opinion, their support is not the fastest or the best, but still decent. However, their press releases and social media are not regularly updated. If you need a low-cost and non-resource-intensive shared hosting solution for your personal website or small online store, Netfirms has a decent selection of services with pre-installed software. You might not get the best support, but it’s mostly made up for by the rest of their service. 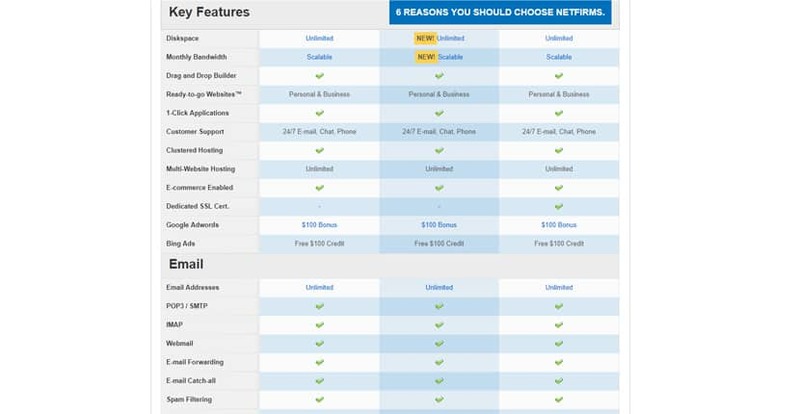 Wondering how Netfirms stacks up against other Web Hosting companies? Enter any other Web Hosting company and we will give you a side-by-side comparison.